Happy New Year! We kick off the first Trail Bytes of 2018 with a recipe from traditional Scottish fare called Rumbledethumps. With a name like that, it has to be good. 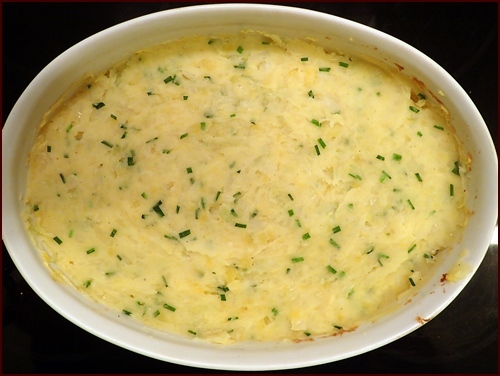 The two main ingredients are potatoes and cabbage, but turnips and onions are often added. I included turnips in mine, plus fresh chives instead of onions. 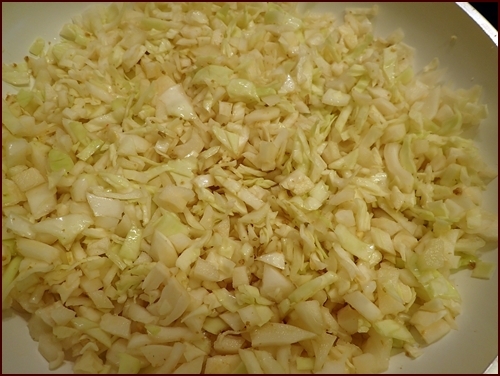 Butter is also called for, but since I planned to dehydrate the meal, I cooked the cabbage with water and vegetable bouillon. For serving at home, a generous portion of shredded cheese is melted on top during the last ten minutes in the oven. Take a peck of purtatoes, and put them into a boyne — at them with a beetle — a dab of butter — the beetle again — anither dab — then cabbage — purtato — beetle and dab — saut meanwhile — and a shake o’ common black pepper — feenally, cabbage and purtato throughither — pree, and you’ll find ’em decent rumbledethumps. Additional ingredients if not dehydrating the meal: Use a liberal amount of butter, instead of water and bouillon, to sauté the cabbage. 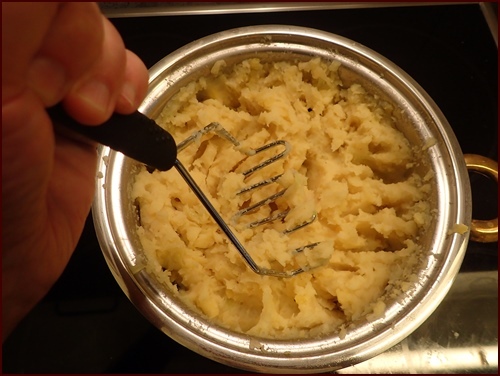 Add a few more pats of butter when mashing the potatoes and turnips. Add a cup of shredded cheese on top during the last ten minutes of baking. Peel and chunk potatoes and turnips. Cover with salted water (I used 1 tsp salt) and boil until soft, about 20 minutes. 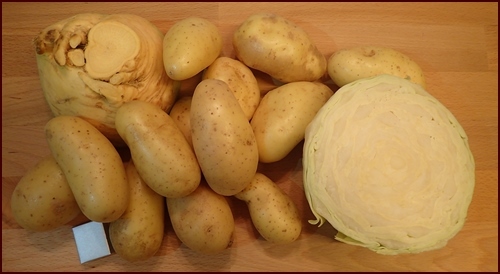 While potatoes and turnips are cooking, sauté chopped cabbage in ½ cup water with 10 grams of vegetable bouillon until the liquid evaporates, about eight minutes. I used a white cabbage, but a green savoy cabbage would be an excellent choice, too. When potatoes and turnips are soft, drain liquid. Return to pot and hand mash with the cooked cabbage. 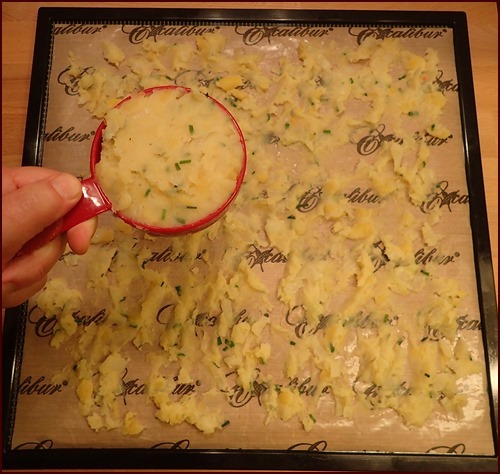 Fold in chives after the mixture is mashed and add salt and pepper to taste. Transfer rumbledethumps to a baking dish and bake for twenty minutes. If serving for supper, top with shredded cheese after twenty minutes and bake for an additional ten minutes. The cover photo at the top shows what the meal looked like with cheese on top. (I made it twice) We omit dairy products like butter and cheese, which could spoil during storage, from dehydrated meals. This recipe produced 5½ cups of cooked rumbledethumps. I ate the extra ½ cup and spread the rest evenly on five Excalibur trays, one cup per tray. It was thick, so it took a bit of effort to spread it around with a spatula. 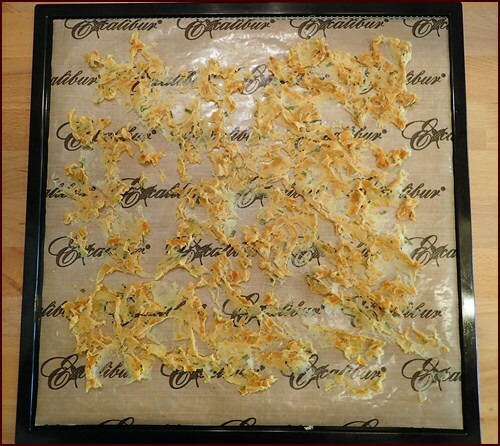 For convenience, each tray's yield can be bagged into a single serving after drying. I weighed the first cup of rumbledethumps before spreading it and then weighed the results again after dehydration. Since one milliliter of water weighs one gram, 191 milliliters of water would be required to reconstitute a one-cup serving back to its original condition. 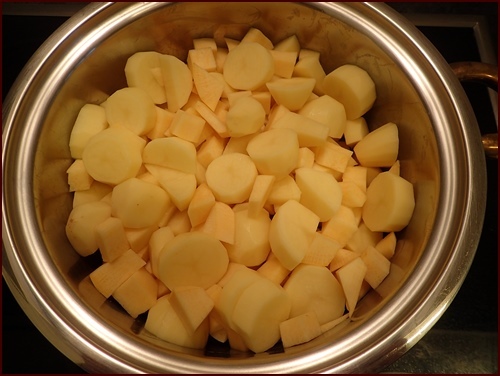 Potatoes are forgiving as far as rehydration goes – a skosh more water will still bring good results. Translated into cups, 191 milliliters is more than ¾ cup, but less than one cup. I’d hedge on the high side to avoid the possibility of potatoes scorching to the bottom of the pot on the trail. Many water bottles, like the Nalgene brand, have markings for both cups and milliliters, so you can measure using your preferred method. Delicious. It was nice and creamy with a little chew remaining from the cabbage. Dominique took seconds. For supper, I served it with wienerli (small sausages) and green beans. To make it a full one-pot backpacking meal, I might combine it with dried ground beef or ham, plus dried green beans. Combine 46 grams dried rumbledethumps (weight of one tray after drying) with 200 ml (a little less than one cup) water in pot. Soak for five minutes. Light stove and bring to boil. Boil gently for one minute, then transfer pot to an insulating cozy. Wait ten to fifteen minutes. Stir vigorously to return to mashed potato consistency. If carrying a block of cheese, slice some on top before serving. Reconstitute and cook at camp as described above, then transfer rumbledethumps to a skillet and fry in butter until browned. Top with cheddar cheese. To reconstitute the full yield of this recipe (five servings), use one liter of water. Serve with hot dogs or sausages cooked on sticks over the campfire, or with the fish you caught earlier in the day. To celebrate my 60th birthday in July, Dominique and I are going to Scotland. 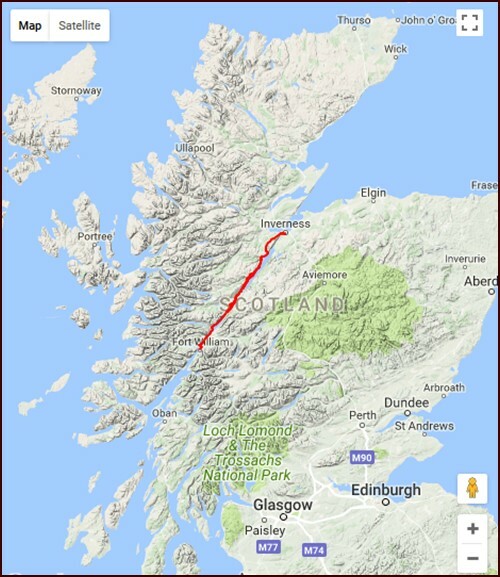 We will hike the 79-mile Great Glen Way from Fort William to Inverness. My last name, McAllister, and my middle name, Owen, are both of Scottish origin. My first name, also of Scottish origin, means quiet or secluded valley. So, this is kind of a “roots” trip for me. The Great Glen Way follows the fault line which divides Scotland from coast to coast, along several lochs and the Caledonian Canal. We’ll keep you posted as plans develop. 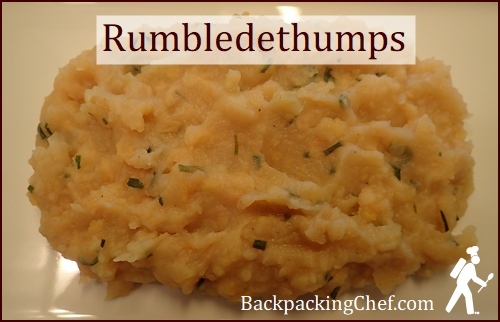 Let me know if you try the rumbledethumps recipe. Dominique and I wish you all the best and many happy trails in 2018.